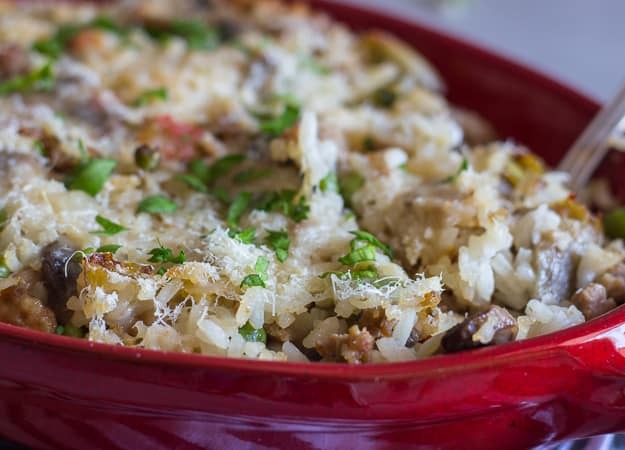 Italian Sausage and Vegetable Rice Casserole, a quick and easy dinner recipe, rice lots of veggies, Italian Sausage and Parmesan Cheese make this Casserole the perfect Main Dish. 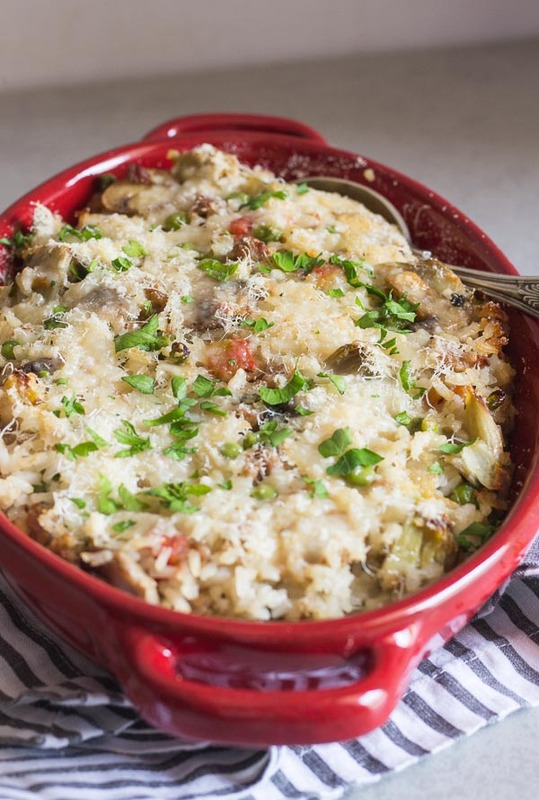 Italian Sausage and Vegetable Rice Casserole, has become our new fall favourite. As soon as September hit, I decided heat or no heat I’m going for the casseroles! I am back this month with three of my favourite bloggers and this month we have decided that September will be Rice Month! I have to say the Italian is not a Rice lover, but the rest of us love it. So I thought this month could be a bit of a challenge. In the back of my mind I’m thinking “will he like this Italian Sausage and Vegetable Rice Casserole or not”? 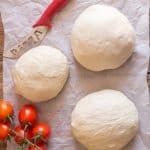 My husband is a man of few words when it comes to food he likes, and If he reaches for a second helping, that is definitely good news. If he likes something he will not comment. If he doesn’t, well then he will give his opinion (whether you want to hear it or not 😉 ) on how to improve it. So needless to say he reached for a second and a third helping, “Buono”. And yes it was good. A simple and quick weeknight dinner recipe. For those who like rice and maybe even for those who don’t! Buon Appetito! 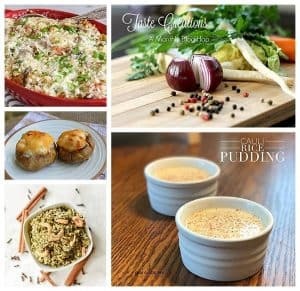 A few more Rice Dishes you may enjoy. 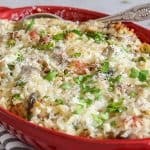 Italian Sausage and Vegetable Rice Casserole a fast and easy any day of the week Dinner recipe, full of veggies, sausage and Parmesan. 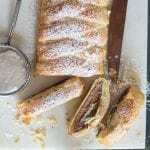 In a small plate combine 3 tablespoons bread crumbs and 1 tablespoon melted butter. 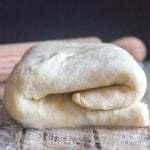 Place on bottom of a medium sized Baking Dish and set aside. In a large saucepan melt butter add onion, sausages and mushrooms and cook approximately 5 minutes until golden, then add peas, artichokes and tomato and combine. Stir in broth, oregano, parsley, salt and pepper (hot pepper flakes), slightly cover and cook on medium for approximately 15 minutes until vegetables are tender but mixture will remain a thick soup like constituency. Meanwhile cook rice al dente and drain. 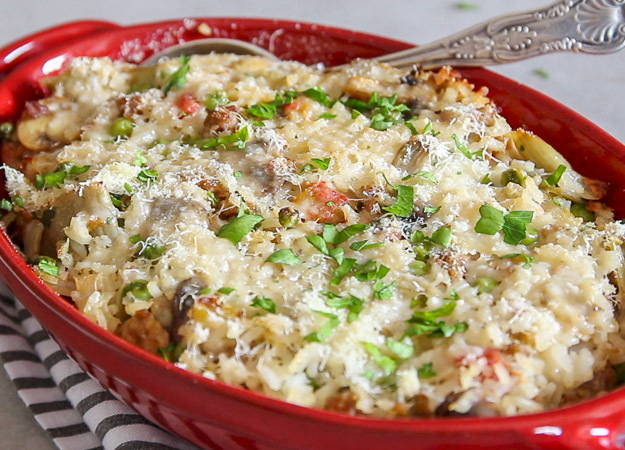 Add rice to cooked veggies and combine, add parmesan and combine. Pour into prepared baking dish and press down lightly. Top with dotted butter and parmesan cheese. Bake for approximately 15 minutes until golden. Serve immediately. I didn’t have any peas or artichokes so I chopped up asparagus. Hubby loves the dish! Thanks for sharing an awesome meal. Hi Diana, great idea and thanks, so glad your hubby enjoyed it! Have a great weekend. 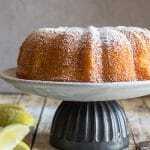 Thank you for a great recipe. I didn’t have any mushrooms and used about half a jar of marinated artichoke hearts instead of frozen. I only had enough Parmesan to mix in so I sprinkled some shredded Colby on top. It was a huge hit with my family. Definitely will be making this again and again! Hi Lora, thank you, so glad you and your family enjoyed it. I love how you substituted the cheese and the veggies. Have a great weekend. I’ve already pinned it. Yes, my Hubby is never too shy to voice his opinion — whether I ask for it or not. What is there not to like with the ingredients?? They sound fantastic. A slice a bread, a small salad, and a glass of wine. A perfect meal!! Buona dominica. Thanks so much Marisa, Have a great week. What a fabulous side dish! I love all those flavors with the Italian sausage. I am looking forward to making this yummy dish! Hi Teri, thanks so much I hope you enjoy it!